In this lesson, we will learn how to solve word problems involving the equation of a circle. 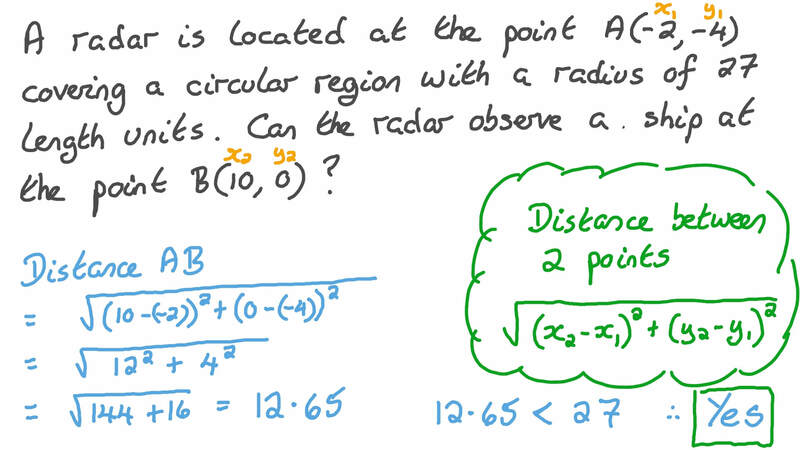 A radar is located at the point 𝐴 ( − 9 , − 5 ) covering a circular region with a radius of 27 length units. 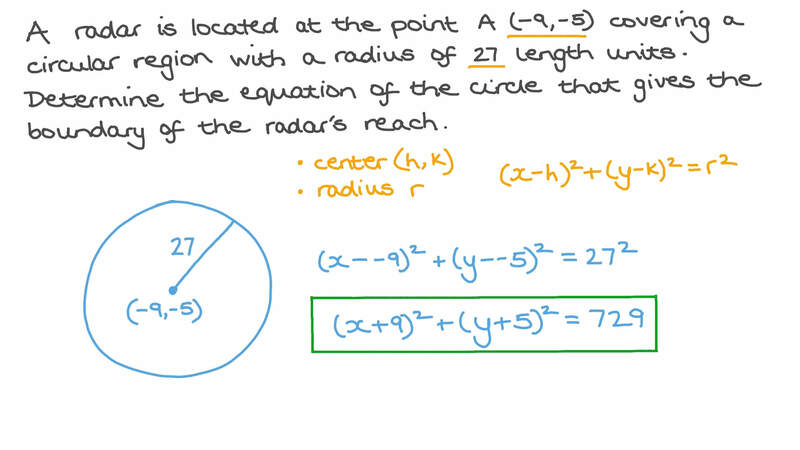 Determine the equation of the circle that gives the boundary of the radar’s reach. A radar is located at the point 𝐴 ( − 2 , − 4 ) covering a circular region with a radius of 27 length units. Can the radar observe a ship at the point 𝐵 ( 1 0 , 0 ) ? The radius of the area in which a rocket may land is three times its current altitude. 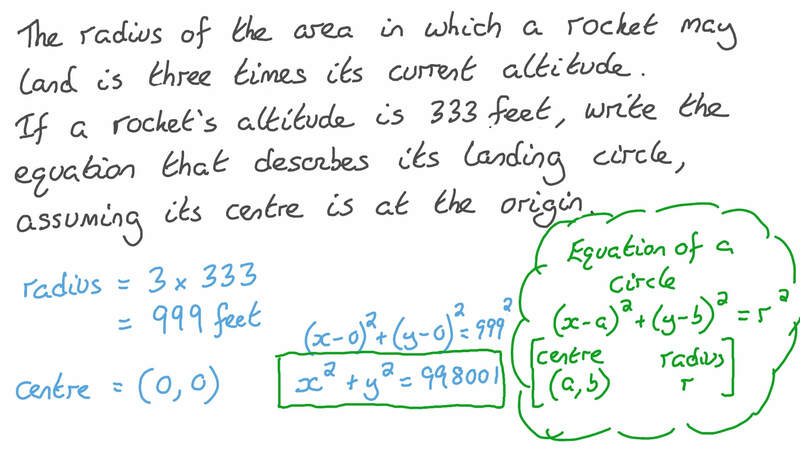 If a rocket’s altitude is 333 feet, write the equation that describes its landing circle, assuming its centre is at the origin. Three street lights are on the border of a circular park. If three street lights can be modeled by the points 𝐴 ( 2 1 , 1 3 ) , 𝐵 ( 1 3 , 2 1 ) , and 𝐶 ( 1 3 , 5 ) , write the equation of the circle that would model the park. Given that 𝑀 , 𝑂 , and 𝑁 are the centres of three circles whose radii are 8, 10, and 5 length units, respectively, and that 𝐶 𝐷 = 2 𝑀 𝐴 = 4 length units, find the general form of the equations of circles 𝑀 and 𝑁 . The given figure shows a pulley 𝐴 having a radius of 5 units, and touching the two coordinate axes. It is operated by a wire that passes over a smaller pulley 𝐵 . If the equation of circle of pulley 𝐵 is 𝑥 + 𝑦 + 6 𝑥 − 1 0 𝑦 + 3 3 = 0 2 2 , and each unit of the coordinate axes represents 4 cm, determine the distance between the centres of the two pulleys. A building is in the shape of a regular octagon. Given that the vertices of the octagon lie on the circle 𝑥 + 𝑦 + 1 2 𝑥 − 2 𝑦 − 6 3 = 0 2 2 , what is the area of the building to the nearest square unit? The figure below represents a vertical cross-section of a tunnel, where the equation of its circle is 𝑥 + 𝑦 + 2 0 𝑥 − 1 0 𝑦 − 4 4 = 0   , and 𝐴 𝐵 is the diameter of the circle. If the unit length of the coordinate system is 54 cm, determine the inner height of the tunnel. A city is divided into regions bounded by circles centred at its city hall building. The first region is within 19 miles of city hall. The next boundary is 19 miles beyond, and so on. Determine the equation of the third circle. The blueprint of a city is in a Cartesian coordinate system, where each unit represents 5 metres. Given that the circle 𝑥 + 𝑦 + 2 𝑥 + 1 8 𝑦 + 4 4 = 0 2 2 represents one of the city’s squares, determine the area of the square to nearest square metre. Consider  𝜋 = 2 2 7  . Find, to the nearest hundredth,the area of the circle . Determine, to the nearest hundredth, the area of a regular 10-sided polygon, given that the circle 𝑥 + 𝑦 − 6 4 = 0 2 2 passes through its vertices.